The most significant threat to healthy Christian spirituality isn’t government persecution or even the cultural acceptance of unhealthy ethics, but incorrect understandings about God. Several common misunderstandings have flourished throughout church history. These paths toward error seem perfectly reasonable; the problem is they’re insufficiently considered in light of the whole Bible. Thus, groups like Docetists and Gnostics arose early in Christian history. More recently Mormons and Jehovah’s Witnesses have recycled historical errors. But theological error doesn’t just come in the form of nicely dressed people knocking on your door to hand out pamphlets. It comes in the form of half-completed discipleship, often with a healthy emphasis on Scripture but without reference to the way Christians have previously pieced Scripture together. Theological error is committed by well-meaning people who pick up a few bits of doctrine and try to put them together without understanding the whole picture. Good theology is important, but it can be hard to get people interested or know where to start. Careful theological work is sometimes dry and dusty business. When the pastor pounds the pulpit to proclaim the importance of a careful logical argument, it’s likely to cause eyes to glaze over. The problem is often not the significance of the issue, but the lack of a vocabulary to explain the problem. B&H Academic (2018). 208 pp. $19.99. Throughout the history of the Church there have been bad ideas, misconceptions, and heretical presentations of Jesus. Each one of these heresies fails to present Jesus as the Bible reveals him. And each one of these heresies is embodied in a different comic superhero. Venturing to save the day is Superheroes Can’t Save You: Epic Examples of Historic Heresies, a recent book by Western Seminary theology professor Todd Miles. The book offers a creative presentation of a robust orthodox theology by showing how historical errors about the nature of God lead away from saving faith. It connects the church’s thinking about specific theological heresies to beliefs commonly held today. Miles offers a culturally accessible vocabulary to explain seven theological errors that continue to pop up in church history. Each chapter briefly describes a popular comic-book hero, illustrates how a common heresy is embodied in that hero, identifies the error in our time, uses Scripture to debunk the error, and concludes by explaining why avoiding it is so important. Theological error doesn’t just come in the form of nicely dressed people knocking on your door. It comes in the form of half-completed discipleship. For example, chapter one connects Docetism to Superman. Although the world around him sees mild-mannered Clark Kent, who seems merely a frail human, the reality is that the Man of Steel is an entirely different sort of being. The heart of Docetism is that Jesus was God in disguise, much like Clark Kent was an alien with superpowers disguised as an ordinary person; Docetists believed in Christ’s divinity while minimizing his humanity. The Superman heresy is problematic because it undermines the common humanity we share with Christ. Thus, when we see Christ’s moral example in Scripture, our response may well be apathy and disappointment, rather than obedience. After all, if Jesus wasn’t human, then he couldn’t have experienced temptation in the same way we do. But that is not the case (e.g., Heb. 4:15). Miles then outlines a biblical doctrine of the true humanity of Christ, showing that if Jesus wasn’t truly human, his sacrificial death couldn’t have reconciled us to God. In this way Miles uses Batman, Ant-Man, Thor, Green Lantern, the Hulk, and Spider-man to illustrate common heresies and show why they’re significant. In doing so, he combats theological liberalism, Modalism, Arianism, Adoptionism, Apolliniarianism, and Eutychianism. Simply getting some people to read a book that defines and refutes these errors, particularly using the terms themselves, requires something like a superpower, which makes me wonder what Miles’s origin story is. Any book that depends heavily on a cultural meme to engage audiences is likely to be either a catastrophic failure––falling into gimmickry and labored analogies––or a rousing success. The opportunities for the former are wide, varied, and easy. Miles, however, successfully navigates the pitfalls of his approach to produce an important and helpful volume that offers both clear theology and also practical application. Superheroes Can’t Save You is a success that makes sound theology culturally relatable. Superheroes Can’t Save You is a success that makes sound theology culturally relatable. This book is useful for individual or group study. Each chapter includes questions for personal reflection and for group discussion. It’s clear this book is an exercise in pursuing truth for the sake of holiness, rather than a theological exercise for its own sake. Miles has done a lot of the legwork to connect right belief to proper living, which increases the usefulness of this volume. Getting people to read theology can be a challenge. A great deal of theology tends to fall into extremes: the most engaging presentations are often the most harmful, while some of the most important theology is difficult to read. There are wonderful, infrquent exceptions. When an author combines an engaging approach with sound, practical theology, his or her work should be celebrated. 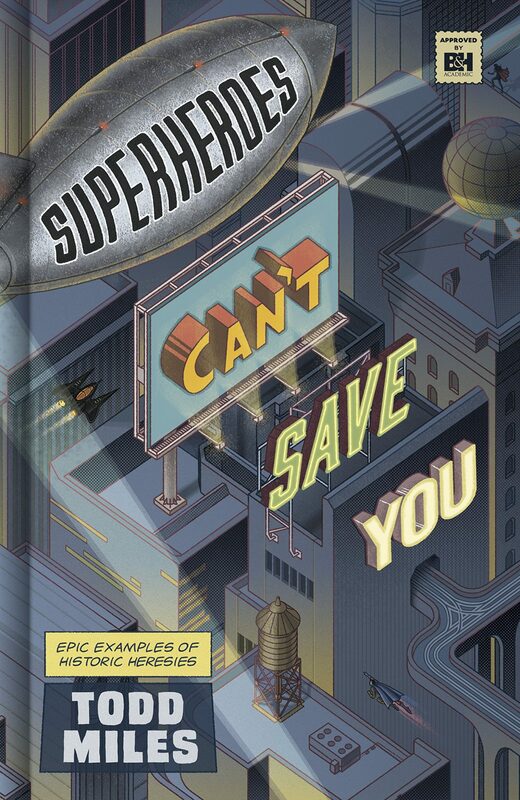 Superheroes Can’t Save You is such a book. Andrew Spencer (PhD, Southeastern Baptist Theological Seminary) lives with his family in Monroe, Michigan, and attends CrossPointe Church. He writes regularly at Ethics and Culture.